We have discussed the dangers of winter driving conditions in previous blogs, but what can you do to make sure your car is prepped for winter conditions? Ensuring that your car is operating safely and ready for snowy or icy conditions can help to prevent accidents and injury. Our car accident attorneys are experienced in representing individuals and families impacted by motor vehicle collisions. In addition to helping our clients recover financial compensation for their losses, we are also dedicated to keeping the community safe and informed to prevent future accidents. Please do your part to stay safe through these long weeks of holiday travel. Winter driving conditions can create a number of hazards. You could face blinding snow, sleet covered or icy roads, or deep mounds of snow. Motor vehicles can be impacted freezing temperatures. Many cars will also encounter problems because of road salt, including clogs and other build-up. Whether you have already encountered a winter storm or you want to learn more about being prepared in the future, here are some tips to prepare your vehicle for winter weather conditions. Get your tires checked. You should have your tires changed and alignment checked. While this can be costly, it will ensure that your wheels are wearing down at the same pace. Rotating tires keeps the tread and pattern continually fresh. If your tires go unchanged, this could make it more difficult for your car to gain traction. Check your brakes. If you have been considering new brakes or brake pads, you should have upgrades made before the winter season. 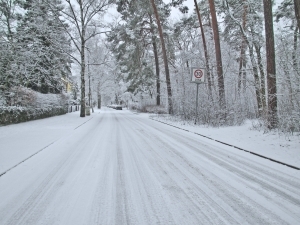 Braking during winter is necessary and become tricky in the snow or on ice. If you have an SUV with all-wheel drive or four-wheel drive, you may feel safer, but remember that if you lose control on ice, you won’t be able to stop faster. Larger vehicles can also lose traction more easily. Always keep your tank full. One of the main reasons to have a full tank of gas is that you don’t want to run out on a snowy day. During the winter months it is even more important to have a full tank. If your tank goes below half full during a cold winter you can get condensation which can cause your engine to run poorly. Make sure you have enough anti-freeze. Anyone who has driving through ice and snow knows the importance of having antifreeze in your vehicle. If you are running low on coolant freezing temperatures can cause your radiator to freeze which can prevent it from cooling the engine. Ultimately, this can cause your engine to overheat. Change your windshield wiper fluid. Did you know you can buy seasonal fluids? A winter blend also has alcohol to prevent it from freezing when it hits your windshield. Many winter blends also have de-icing properties. Having a sufficient amount of windshield wiper fluid can be critical to ensure visibility on a snowy or icy day. If you know you will be heading into dangerous winter conditions, prepare for the worst. Always have proper tools, including jumper cables, but you can also bring safety items such as clothing, boots, a shovel, matches, cash, flares, water and food. If you lost a loved one in an accident, contact Jeffrey S. Glassman for a free and confidential appointment to discuss your rights. Call 1-888-367-2900.